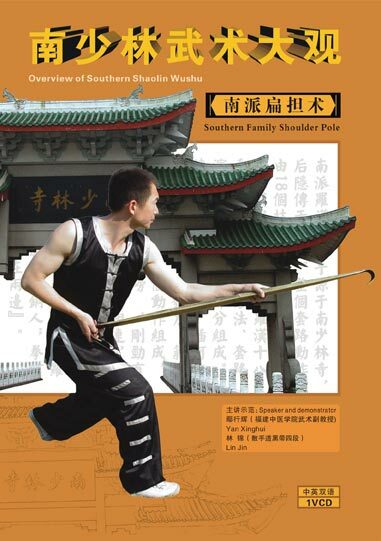 Southern Family Shoulder Pole, taken as compulsory lesson in the temple, is originated from Southern Shaolin Temple at the beginning,then expanded in society. The pole is called Southern Family Shoulder Pole, who is full of the characteristics of Southern Boxing. Practice methods, exercises and skills appreciation consist of the fist. The way to do learning and practice is shoulder pole hitting, stub and sand bags. There are 18 actions all together in the pole, simple, quick, flexible and unique are the advantages. Good fighting practical usage, he fully express the pole patting, covering,shouldering,sweeping,pressing,againsting,hooking,hanging,supporting,cutting,hitting and so on. The script says: ‘Southern Family Shoulder Pole aims to beat Japanese; Cleaving and hammering makes bleeding; picking and moving damages heart; Hooking makes enemies fall and pole against makes rips broken.